For the last wee while I have been pondering what makes a useful study space. This has come about partly because I’m always searching for the ‘perfect’ spot, while at the same time admiring Andrew’s ability to study pretty much anywhere except a library. I have tried the following, and come up with some pros and cons for each. 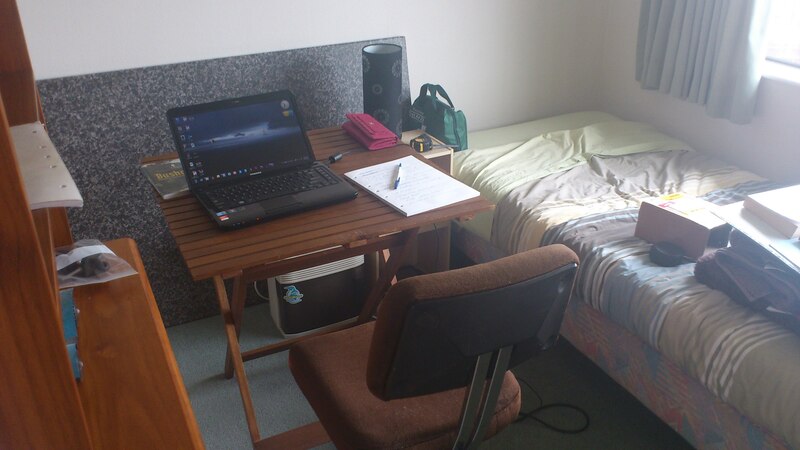 Putting the spare bed into the garage, and turning the guest room into a large study with a massive desk. The good: it was easy to dump all the study stuff in one room and forget about it. The bad: It was easy to dump all the study stuff in one room and forget about it. It was also a pain to dismantle the desk every time we had a guest come to stay. Sitting in the car, at the park, eating strawberries and studying. The good: strawberries are really tasty, and it was good to get out of the house and go study somewhere else that didn’t have internet, so I couldn’t use Facebook. The bad: Sometimes I needed the internet or my laptop, and I couldn’t use either in the car. The good: It was very, very quiet. The bad: It takes me almost an hour to drive there, and there is no cheap food nearby. It’s also easy to get distracted on Facebook! The good: this is one of my favourite places on earth. The whole place has an aura of Godliness about it and I’m extremely privileged to be granted a membership to the facility. The study spaces look out over the bush towards Rangitoto Island. They also have big tables so it’s a good place to spread lots of books out! The bad: I know most of the staff very well and can easily waste an hour having morning tea with them and drinking their tea supplies. It’s also about 40 minutes from home. Studying at home, on a fold up table. The good: the table folds away when it’s finished being used, so our house doesn’t always resemble a student library. I can also move it around the house to follow the sunlight, or to give Andrew some space. The bad: Haven’t thought of any downsides of this so far! The good: The couch is comfy, the kitchen is nearby, and my kitty often joins me for cuddles. The bad: The kitty has a naughty habit of walking across the laptop keyboard, and it’s easy to leave study stuff lying around which isn’t good for my mental health! Not only is the table easy to pack up and fold away, but I like the idea of only having out what I need for the study session, not a whole pile of other stuff that will distract me. It’s also very nice to be able to pack everything away at the end of the session and enjoy having a guest room again. I don’t need a big desk to accumulate lots of junk – so that’s another thing that’s gone to a new home. What study solutions work for you? This entry was posted in Minimalism, Study and tagged decluttering, minimalism, study. Bookmark the permalink.